Advanced energy storage refers to the process of storing electricity after converting it into energy. The energy is converted back to electricity for later use. Advanced energy storage technologies amass energy from different sources and store it in different mediums for a period of time before supplying it to power or energy providing services. It comprises of conventional as well as novel energy storage technologies such as pumped hydro, battery storage, flywheel, thermal, and hydrogen storage. The global appetite for electricity is rising at a massive pace owing to factors such as rapid urbanization, industrialization, and the mounting rise in global population. As a result, the need for energy storage is anticipated to remain strong to timely and efficiently supply power to the required end-user. The demand for effective and advanced energy storage technologies is also rising due to development in renewables energy resources, improvement of antiquated utility grid networks, and higher energy demand costs. Transparency Market Research estimates that the global advanced energy storage market, which had a valuation of US$0.87 bn in 2015, will exhibit a promising 5.4% CAGR from 2016 and 2024 and rise to a valuation of US$1.39 bn by 2024. 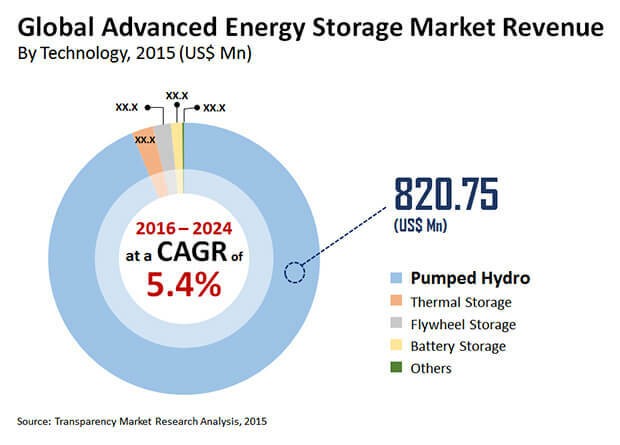 On the basis of technology, the advanced energy storage market has been segmented in the report into pumped hydro, battery storage, flywheel storage, and thermal storage. Of these, the segment of pumped hydro storage accounted for more than 90% share in the global market in 2015. The massive share of the segment in the global advanced energy storage market is attributed to the fact that it is the most economical technology for large-scale energy storage. For photovoltaic systems, battery storage is the most popular choice. Lithium-ion batteries are most common for power generation in mobiles and laptops but need more improvement for power generation applications. Battery storage is still expensive due to a number of factors such as need for new technologies, overcharge protection, and improved reliability and safety. The segment of thermal energy storage, representing another economical energy storage option, is anticipated to grow rapidly in the advanced energy storage market during the forecast period owing to the increasing focus on renewable energy. From a geographical standpoint, the advanced energy storage market has been segmented in the report into regions such as North America, Latin America, Europe, Asia Pacific, and Middle East and Africa. Of these, the demand for advanced energy storage systems was the dominant in Asia Pacific in 2015, followed by Europe and North America. The development of advanced energy storage market began relatively late in Asia Pacific as compared to developed regions such as Europe and North America. However, it has seen rapid growth in the past few year and is also expected to exhibit impressive growth over the forecast period. The market is expected to exhibit growth at a relatively lower pace in Europe and North America than Asia Pacific as both the regions feature mature markets for advanced energy storage. The Asia Pacific market is anticipated to exhibit strong growth over the report’s forecast period owing to vast developments in the power distribution infrastructure, especially across thriving economies such as China, India, and South Korea. Some of the leading players operating in the global advanced energy storage market are AES Corporation, EDF Renewables, Schneider Electric, Maxwell Corporation, LyondellBasell Industries N.V., and INEOS Group AG. Other prominent players include SAFT S.A, Green Charge Networks, LLC, S&C Electric Company, NEC Corporation, Beacon Power LLC, Dynapower Company LLC, and EOS Energy Storage. Advance energy storage is a process of storing electrical energy and then utilizing it later. Advanced energy storage is a combination of energy storage medium enabling technologies such as, communication networks, distribution monitoring software, and many more. Advanced energy storage technologies amass energy from different sources and store it in different mediums for a period of time before supplying it to power or energy providing services. The report provides in-depth analysis and forecast of the advanced energy storage market on the global as well as on regional level. The report includes forecast for the period from 2016 to 2024 in terms of volume (MW) and revenue (US$ Mn). Quantitative data has been derived through extensive secondary research of the global advanced energy storage market. Secondary sources typically include company websites, relevant magazines, government documents, and press releases. The top-down approach has been adopted to derive the regional numbers from global revenue and volume figures. Furthermore, the bottom-up approach has been employed to derive data for various technologies and application segments based on demand for advanced energy storage in each geographical segment. A combination of top-down and bottom-up approaches helps in validation of the quantitative data of the market. The data was further validated with the help of primary research with industry experts to ensure accuracy of derived numbers. Detailed analysis of various factors driving the global advanced energy storage market has been included for astute decision making. Impact of these drivers during the forecast period has been included with data to substantiate research findings. Furthermore, factors restraining market growth have been included for better understanding of the market. Impact of these restraints has been analyzed over the forecast period. The report also comprises various opportunities available for market growth over the next eight years. Opportunities entail untapped or recently explored factors that are anticipated to drive the advanced energy storage market during the forecast period. The report includes value chain analysis to help understand the industry thoroughly. Value chain analysis comprises detailed evaluation of the roles of various entities involved in the advanced energy storage industry, from raw material suppliers to end-users. Various processes employed in the manufacture of advanced energy storage have been included in the value chain analysis. Porter’s five forces model has been included to determine the degree of competition in the market during the forecast period. Furthermore, market attractiveness analysis has been conducted to analyze application segments that are expected to be lucrative during the forecast period. This is based on various factors such as market size, growth rate, profitability, raw material procurement, and competition in each application segment. Based on application type, the advanced energy storage market has been segmented into on-grid, off-grid, micro grid and others application segment. The report comprises detailed analysis of all the segments in the regional and global markets and forecast based on current and future trends in the industry in terms of volume (MW) and revenue (US$ Mn). In terms of region, the market has been segmented into North America, Europe, Asia Pacific, Latin America, and Middle East & Africa. Demand for advanced energy storage in each application segment type has been analyzed and forecast for a period of eight years. The report also comprises profiles of leading companies in the advanced energy storage market. These include AES Corporation, EDF Renewables, Schneider Electric, Maxwell Corporation, LyondellBasell Industries N.V., and INEOS Group AG. among others. Various attributes of these companies such as company overview, business strategies, and recent developments form the core of the company profiles section.